It’s important you keep your bike well maintained. Don’t try and fix things you don’t know how to, this can be very dangerous. Take it to a bike shop and get a trained bike mechanic to do it for you. Check they work every time you start a journey. 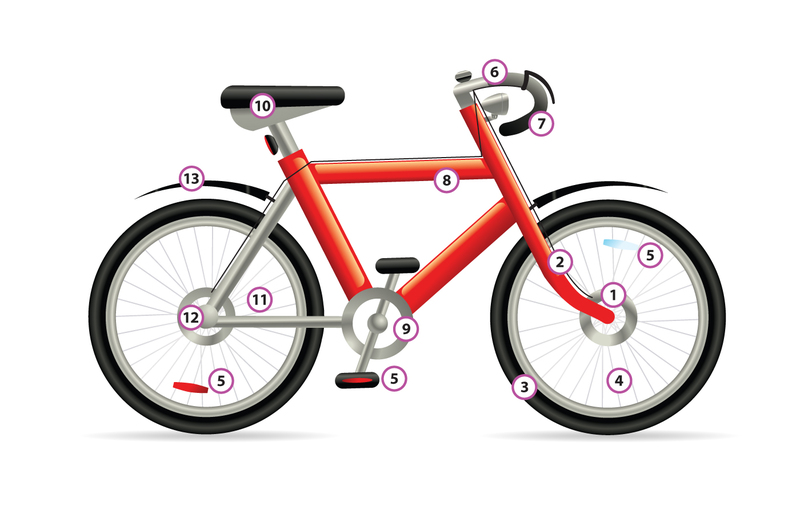 If your bike was bought in the United Kingdom, the back brake is on your left and the front brake is on your right on the handlebars. If your bike was bought on the continent, they will almost certainly be the other way around. To see if they work, roll the bike forward and put the front brake on, the back wheel should lift off the ground. Then roll your bike backward, put the back brake on and the front wheel should lift off the ground. Keep an eye on the brake blocks that they are in the correct position and not becoming worn. If you have disc brakes a cycle shop needs to check these for you for wear. When you squeeze the brake levers, you should be able to get a finger between the brake lever and the handlebar. At the beginning of a journey, check no one has disconnected the brake cables, perhaps as a joke, this is very dangerous. This can sometimes happen accidentally when getting a bike on and off a car bike rack. Check the brake cables occasionally that they are in good condition and not showing any signs of wear. As your bike gets older, the brake levers may begin to return to the ‘off’ position almost in slow motion. This probably means the brake cables are corroding on the inside and need replacing. There are lots of different types of tyres that can be on a bike. Some thick, some thin, some with ‘tread’ or ‘grip’, some with no ‘tread’ or ‘grip’. Make sure your tyres are well pumped up; really hard; always use a bike pump to do this. This helps make it easier to ride and more difficult to get a puncture. If your tyres have tread, get them changed when they are wearing out. If you like to skid on your bike, this will happen quickly. Check the rubber for lots of cracking, if this happens you will need to change the tyre. Check for damage and the spokes are not lose by gently squeezing the spokes around the wheel. Spin the wheel and make sure the wheel has no buckle (bending) in it and it doesn’t have any movement in it. If you ride on the road in the dark you must have a red reflector on the back of your bike and two pedal reflectors on each pedal. There should also be a white reflector at the front, and one reflector on each wheel. This can become loose and should be tightened. To check, put the front wheel between your legs and try turning the handle bars. If the bar moves, it needs tightening. Make sure they have good handle grips. The plugs in the side of the grips often come out. This can be very dangerous and they should be replaced as soon as possible. The handle bar should be lined up correctly. Check occasionally for cracks and bends and all nuts are tight. Should have good grip and spin freely. If you hold the peddal shaft and try and move the peddal from side to side, there should be no movement. Oil the moving parts regularly. Should be oiled regularly with a ‘bike oil’ NOT WD40 (unless it is the bike oil version) or similar. There should be no sign of rust. Make sure they are adjusted and they all work. It is usually best to take this to the bike shop if they need adjustment, it is a skilled job. They aren’t very popular at the moment, but in the winter they will stop you getting dirty when the roads are wet. Make sure they don’t catch on any of the moving parts.